FEA Training Consultants Inc. full service Design Engineering Team based in Mississauga, Ontario, the Design Simulation Group is involved in some of the most demanding mechanical stress and fluid flow simulation projects in industry today. FEA Training Consultants Inc. is a licensed engineering company and holder of CoA (Certificate of Authorization) issued by Association of Professional Engineers Ontario to offer professional engineering services. FEA Training Consultants Inc. is seeking an Finite Element Analyst to work in our Design Simulation Group. As a member of our team, you will work with our experienced Professional Engineer(s) with a long history of Finite Element and Fluid Flow simulation expertise. Bachelor’s Degree in Mechanical Engineering or higher. Minimum 5 years proven experience in using Finite Element Simulation. Ability to interpret analysis results based on modeling technique and material fatigue charecteristics. Strong analytical background with demonstrated proficiency in engineering principles and calculations. Strong presentation and communication skills at all organizational levels. Experience with dynamic, fatigue analyses and CFD is an asset. We offer execellent compensation and profit sharing plan. Please submit your cover letter and resume to careers@fea-tc.com with subject “FEA Analyst”. Please NO PHONE CALLS. FEA Training Consultants Inc., SOLIDWORKS Reseller in Ontario, has an immediate need for Technical Sales representative in their Mississauga, Ontario office. The ideal candiate should be able to achieves maximum sales profitability, growth and account penetration within an assigned territory and/or market segment by effectively selling the company’s products and/or related services. Personally contacts and secures new business accounts/customers. Building Consensus and closing sales. Bachelor’s Degree in Business or Engineering. Mininum 1 to 3 years experience in sales. Demonstrates aptitude for problem-solving; ability to determine solutions for customers (consultative sales approach). Must be results-orientated and able to work both independently and within a team environment. Must possess excellent verbal and written communication skills. Please submit your cover letter and resume to careers@fea-tc.com with subject“Technical Sales”. Please NO PHONE CALLS. SOLIDWORKS Corporation is the leader in 3D Computer Aided Design (CAD) and Simulation technology, empowering product design teams with intuitive, high performance software that is easy to use, and provides the freedom to design products with real competitive advantage. SOLIDWORKS Corporation has grown rapidly in the last 10 years and is enjoying accelerating sales growth in the Ontario. FEA Training Consultants Inc., SOLIDWORKS Reseller in Ontario, has an immediate need for Applications Engineer in their Mississauga, Ontario office. Provide comprehensive Pre and Post Sales Technical Support for the SOLIDWORKS product including demonstrations, training, product positioning, and competitive overviews. Deliver product presentations to prospects both at the end user level and senior management level. Serve as primary technical liaison for assigned geographical or account territory. 2 to 5 years of SOLIDWORKS industry experience. BS Mechanical or Manufacturing Engineering or Technologist with 3D modeling experience. Good knowledge of the SOLIDWORKS industry coupled with 2 to 5 years’ experience. Proven strong verbal and written communication skills as well as excellent customer relations skills. Must have CAD and/or solid modeling experience and actual design work experience. Requires in-depth experience with Windows and SOLIDWORKS. 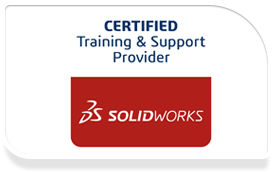 Comprehensive working knowledge of SOLIDWORKS (CSWP or equivalent a strong plus). Some 2-D experience would be a plus – To understand the pain of the 2D customer. Any experience with downstream applications (CAM, FEA, PDM…) is a plus. Excellent analytical and technical troubleshooting skills. Understands Engineering and mechanical design processes and terms. Understands 3D Solids Modeling processes and techno-speak. Mechanical design experience with emphasis on product design and assemblies. Industrial design and tooling design a plus. Understands solutions selling and the technical sales process. Presents a professional image and comes across as a confident and credible speaker. Communicates well – Speaks clearly and concisely. Not afraid to be in front of large audience. Excellent time management, written communication and organizational skills. Please submit your cover letter and resume to careers@fea-tc.com with subject“Solidworks Application Engineer”. Please NO PHONE CALLS.